I taught my first “digital humanities” course in the spring of 1998 when I was a visiting assistant professor at Grinnell College. My students created a “virtual archive” of primary sources, building a website that made it easy (in 1998 terms) to access the sources they placed in the archive. They wrestled with such things as metadata, whether or not to post the sources in both English and the original language, user interface, and website design issues. While they liked the class, that group of pioneering students found their lack of technical knowledge – when it came to such things as website design and information architecture – to be very frustrating and inhibiting. Fifteen years later, not much has changed. Sure, the technology has changed a lot, and there are many tools that have lowered the bar of entry for students to start building digital humanities projects. But the challenges I faced in 1998 are, in many ways, the same challenges I face today. Every course I teach that has a digital humanities component requires me to spend a significant amount of time getting the class up to speed with the technologies they need to use so they can create whatever it is that either I’ve assigned or they’ve determined they ought to create. I find that I am doing just as much tech support in 2013 as I did in 1998, and all that time devoted to tech support detracts substantially from the final results my students achieve. We just don’t get to spend enough time on the important and interesting historical and humanities issues that are central to the course. And my students are often just as frustrated, if not more frustrated, as I am by this problem. There are plenty of reasons why many undergraduate students come into our digital humanities classes ill prepared to do the work we expect. Despite their facility with the technology when it comes to making connections with others, locating that video/song/story/picture/meme they are interested in, they are often very inexperienced with digital work beyond the creation of a slideware presentation. One solution would be to urge our colleagues to add a digital “making” course to the general education curriculum. But doing that means either adding one more course to often overly burdensome general education requirements, or deleting some other course, with all the controversy such a change to the general education requirements can cause on our campuses. Another possible solution, and the one I plan to start advocating, is to try to break free from the 14 week semester or 10 week quarter when we teach the digital humanities. The semester/quarter, it turns out, is just not enough time to do sophisticated work in this emerging field. My proposed solution is a new digital history “course” that will extend over multiple semesters, giving students the opportunity to enroll for one, two, three, or even four semesters, as they work together to realize a much larger and more sophisticated group project than is possible in just 14 weeks. The idea I have in mind lives somewhere between a standard course and an internship and so for lack of a better term, I’m calling it a workshop. We have no such name or classification in our catalog, so I’ll end up having to call it a course, unless I can get away with calling it a lab, which is actually much closer to the reality of what I have in mind. Because I’m also very interested in learning spaces, I’m planning to use this “course” or “lab” or whatever as a way of experimenting with the intersection between public digital history and making space on a college campus. Right now I have a draft proposal just starting to float around campus. My hope is that by the end of the summer I’ll have something acceptable enough that I can start it through the necessary approvals that will then lead to a roll out of the course in the fall of 2014. Once I get some feedback on version 0.1, I’ll post it here for further public comment. In the meantime, I’d love to hear from people who have been teaching digital humanities to undergraduates – what has worked, what hasn’t? This entry was posted in Posts and tagged Curriculum, Digital History, digital humanities, learning spaces on June 25, 2013 by Mills. Anyone who has taught at a college or university has experienced the follow scenario countless times: Students come to class on day one and choose their seats. Students sit in those exact same seats for the rest of the semester, even if moving (say, to be with members of a work group) would be more practical or to their advantage in some way. Just because I am a disruptor at heart, but also because I want them to think about why they are sitting in the same seats over and over and over, I sometimes force my students to sit in a different place. If you really want to have fun in a seminar, arrive early on week four or five and grab someone else’s seat, then watch the discombob-ulation that follows as students enter the room and try to figure out where to sit in the new circumstances. For years I’ve wondered why students cling so tenaciously to the seat they chose on day one. Now I know. Last night I was doing a teaching observation for a colleague who was teaching about behavioral economics and what the findings from this sub-discipline can teach us about the economic choices people make. It turns out that the behavioralists have a name and an explanation for my students’ behavior–status quo bias. Now that I know the answer to this question that has puzzled me for years, I’m going to have to go read the book my colleague assigned for last night’s class (Dan Ariely’s Predictably Irrational) to see what other insights I can glean that will help me understand my students choices when it comes to learning. 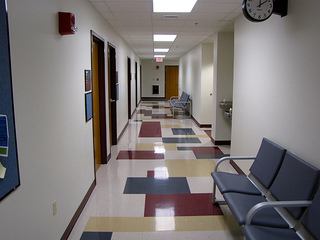 This entry was posted in Posts and tagged economics, learning, learning spaces on November 29, 2012 by Mills. For reasons I’m not entirely sure I understand, I am on three different university level committees this semester concerning themselves either entirely or to a limited degree with the question of what the classroom of the future ought to look like. This is a particularly pressing issue here at George Mason because we are getting ready to build a major extension on our library and two new large buildings, each of which will house at least 10 new classrooms (or “learning environments,” as one of the committees now calls them) . On top of that, we are in the midst of a reconsideration of our strategic plan, one piece of which was the “Future of Higher Education” conference held here at the beginning of the month. It seems obvious to me that there must be some sort of relationship between learning and physical space, but the decisions we’re making on these committees involve hundreds of thousands, if not millions of dollars, not to mention the fact that whatever we approve will be the classrooms those buildings have for a decade or more. So the stakes are high. For this reason, I want research, data, on the relationship between space and learning, before we make these decisions. These are all good questions, but they don’t help me now, this semester, with the decisions we need to start making. All of the research I looked at, by the way, seemed in agreement that when confronted with the standard classroom design, most instructors defaulted to the traditional sage on the stage mode of teaching. What would “comfortable, open, flexible, and appealing” classrooms look like? I think we can all agree what they don’t look like, and that is the classrooms that are all over our campuses — rows of desks or tables, many of which cannot be moved, that promote sitting still and listening. I think the answer lies in that quotation from Venturi, Brown, and Izenour that I led off with. To figure out what kinds of classrooms we need going forward from 2012, we need to change the way we look at learning. To do that right, we have to be very clear what we mean when we say “learning” in a discipline like history. Once we’re clear on that, then I think we need to be very self-critical when it comes to how we look at what is and isn’t happening in our classrooms. And then, and only then, can we ask the right questions about how the space and the technology in that space is or isn’t promoting learning. There are a few useful models to work from in physics. The Scale Up classroom developed at N.C. State and the TEAL classroom at MIT. Both of these rooms promote small and large group collaboration by using round tables that are linked to large screens on the wall — the round tables promote small group interaction, the large screens show the rest of the class what is happening in all corners of the room. And studies of learning in both classrooms offered strong evidence that students learning in these rooms learned more content and acquired deeper levels of understanding of that content than students taking the same class in a traditional classroom. Here’s a chance to look at learning in a different way. Take a look at this picture of students learning in this space and you’ll see the interactions taking place, but you’ll also see lots of empty space between the group tables. When we try to see learning happen, we don’t tend to look at open space. We tend to look at students. What would it be like to have that degree of comfort, openness, and flexibility in our classrooms? How would the learning change? That amount of open, flexible, and comfortable space is almost impossible to come by on our campus. More commonly, we cram the maximum number of desks into a room so that we can maximize our productivity (teach more students at once) rather than maximize the learning that takes place. Also, we are under the gun financially and can expect to be under that gun for at least a decade, if not longer. Given that reality, how can we reconcile what we know — that open, comfortable, flexible, and appealing spaces help to maximize learning — with the need to teach ever more students with fewer and fewer resources? That, my friends, is a political problem at a state supported institution like Mason. Without a new commitment of resources from the legislature or a sudden and unexpected infusion of cash from donors we haven’t even met yet, we can’t afford to create classrooms that maximize learning, because we won’t be teaching enough students per class session to balance our budget. I think the best we’ll be able to accomplish in my various committees is the creation of a few new style classrooms in each of our soon to be built buildings. We have our own version of the Scale Up classroom opening in the fall, but it is a large room (70+ students) and will be mostly dedicated to science and engineering courses. Digital humanities courses are generally taught in smaller sections, but I think it’s fair to say, given the budget realities, that we won’t be able to count on more than a couple smaller rooms like the Scale Up room that we can use. This entry was posted in Posts and tagged classroom design, learning spaces on November 16, 2012 by Mills.